Why is The Six Pointed Star the Symbol of Judaism? Synagogues use stars made of two crossed equilateral triangles. The military bury Jewish dead beneath the Jewish star. Christians use the cross because their God died on cross. Muslims use the crescent because, even before the prophet, the crescent was a symbol for worship in Arabia. Mormons use a statue of the angel Moroni. Buddhists use a Buddhist prayer wheel. 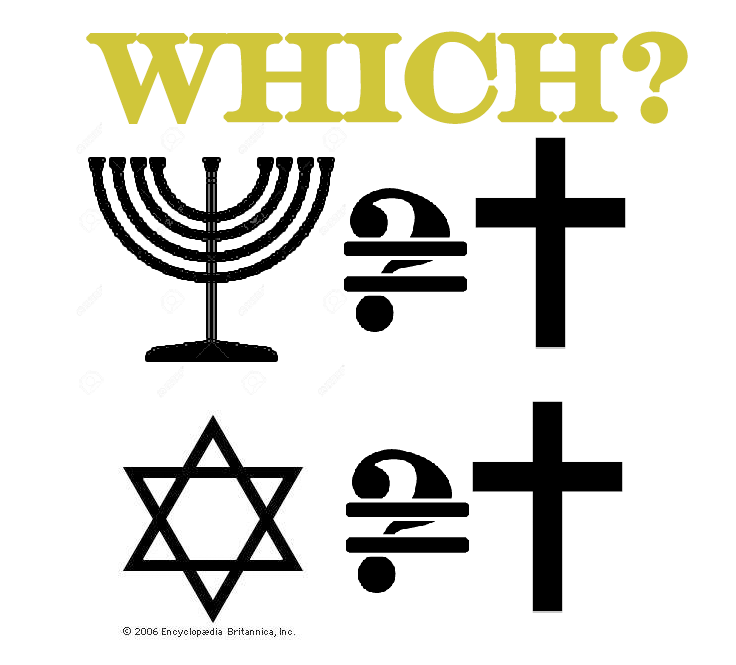 All these fairly ancient symbols are associated with founding a religion. The Christians are especially lucky! If there God had been killed by the Jews, instead of the Romans, the sentence would have been death by stoning. Imagine wearing a boulder around your neck! The exception is the Jewish star. This symbol very modern. You will not find the Star of David digs archaeological digs in Israel. You will not find a Star of David in all synagogues anywhere until sometime late in the 19th century. Why? Until then the symbol of Judaism was the 7 branched candelabra… The menorah. The menorah is found on the walls and in the mosaic floors of ancient synagogues. The menorah is found in the gravesites in the catacombs of Rome. The Jewish community of Prague was the first to use the Star of David as its official symbol, and from the 17th century on the six-pointed star became the official seal of many Jewish communities and a general sign of Judaism, though it has no biblical or Talmudic authority. In 1897, the Zionist movement adopted the Star of David as its emblem and today the “Magen David” is the central feature of both the Israeli flag, Israel’s version of the Red Cross, and the collars of Jewish chaplains in the US military. So the Magen David was not a religious symbol.. it was a national symbol, like the American flag. So why do I wear a star on a necklace around my neck? My star was made as a copy of an eternal light that used to be in the chapel of the Hillel Foundation at the University of Washington. That light was in the center of a jewish star made out of barbed wire taken form one of the concentration camps. For me, Hitler made the Star of David holy! I have told my wife that I want either to be cremated or composted. In either case, I want my star buried with me. If there is to be any sort of token to my memory, PLEASE make it a menorah! Posted 08 Apr 2019 by theaveeditor in Misc. ← WTF: ARE THE SEAHAWKS GOING TO MOVE TO CALIFORNIA?